There are highly exotic-looking flowers in the world, and some look fantastic but smell of nothing, and some smell fabulous but look weird. Here are two extremes: the “Black Rose” of Halfeti, Turkey, and the extremely vivid “Fringed Tulips” which are prolific this time of the year. Halfeti, in the southeastern province of Şanlıurfa in Turkey, on the banks of the Euphrates River, is famous for its roses that are a deep, rich, wine-coloured red when in full bloom, but look black when they are buds. 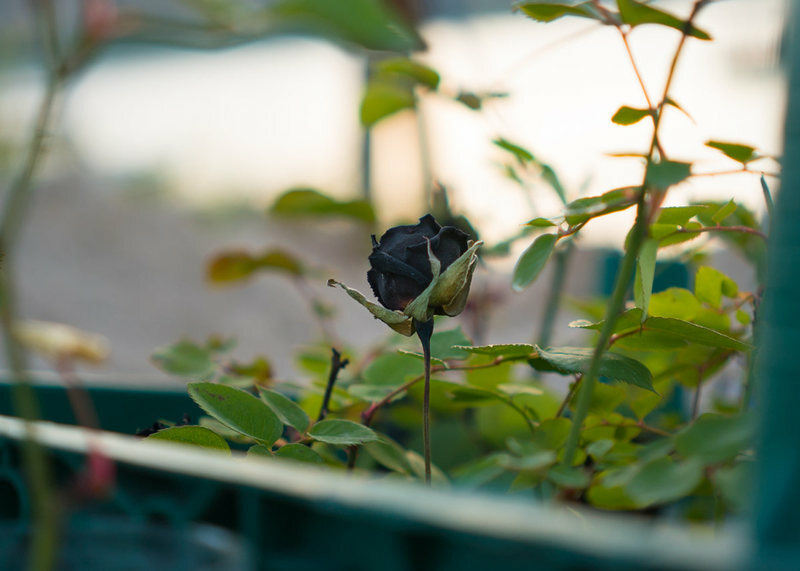 Inhabitants of this town that was half flooded in 2001 to construct a dam in the river, cultivate and sell these black(ish) roses, called kara gül (simply “black rose” in Turkish), to visitors who come from far and wide. The black rose is a local variety of the Rosa odorata species named “Yediveren” meaning “ever-blooming” or “prolific”. It is true that the origin of the rose can be traced back to the 18th century. But the blooms are not actually black. The whole thing started with a viral video in 2013, but a black rose is an impossibility in nature. However, they do smell good – famously so. Penhaligon’s introduced a perfume in 2015 called Halfeti Eau de Parfum, named after the village. How much of the local roses it contains – who knows. Noses have commented that the “rose” in the ingredients is probably Turkish Rose, but that’s as far as it goes. 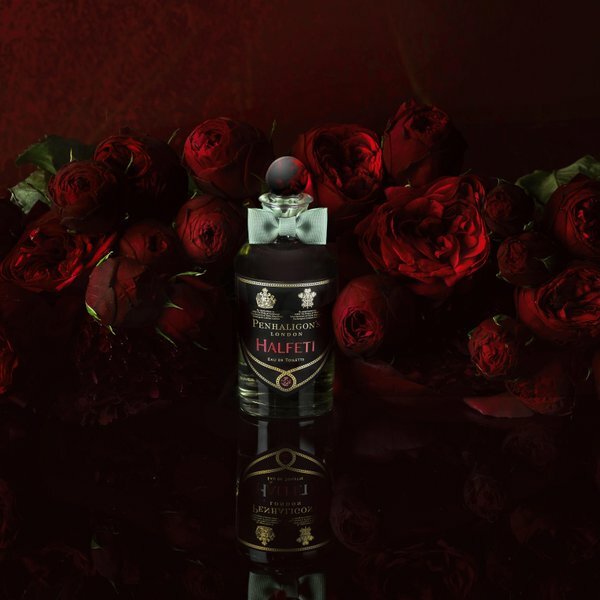 Halfeti Eau de Parfum by Penhaligon’s, London, part of their Trade Routes Collection. It was created by Penhaligon’s allied perfumer Christian Provenzano. The Tulipa “Fringed Family” of tulips bloom this time of year with a bold display of colour that is mesmerizing. They are mutations of other tulip varieties, and have petals that look like the fringes of a shawl or roughly cut hair. Also known as “frilled tulips”, they have large, eye-catching blooms and are mainly used for display. But honestly, having stuck my nose in them, there is no fragrance at all in these pale pink and blood-red tulips. Tulips are bred for their looks, not their smell, though there are a few tulips that have fragrance: Tulipa turkestanica (creamy white), Tulipa tarda (yellow with white), Tulipa urumiensis (yellow) and Tulipa whittallii (bronze orange) have a refined, spicy scent. Ad Rem (orange), Apeldoorn (red) and Golden Apeldoorn (yellow) have a sweet, heavy scent. Angélique (creamy white with pink) has a subtle, fresh and sweet scent, and Orange Princess (orange) is honey-scented. Oh well, dirty musk and powder it is then. Tulips do contain an anthocyanin that causes allergies and induces a dermatitis that affects mostly tulip bulb sorters and florists who cut the stems and leaves. It is not ideal for perfume creation and it is probably not a good idea to stick your nose in them too much. The “tulip note” referred to in perfumes is a laboratory-created floral note, with a light citrusy or spicy touch reminiscent of real tulips. (Like strawberry essence, in other words, pink, but smells nothing like a real strawberry.) In actual fact, a “tulip note” smells precisely neutral, of nothing. Fragrances with “tulip” notes (left to right) are often approximations or recreations of the tulip fragrance: Ti Amo – Tulipano by Hilde Soliani – created along with a line of other flower-named perfumes but containing no scent of tulip; La Tulipe Eau de Parfum by Byredo Parfums – built around the “idea of a tulip”; Multiflor Line Songe de Tulipe II Perfume by Il Profv[u]mo – inspired by a painting of tulips – beautiful but scent-free.